Service trolley with structure and shelves in stainless steel. 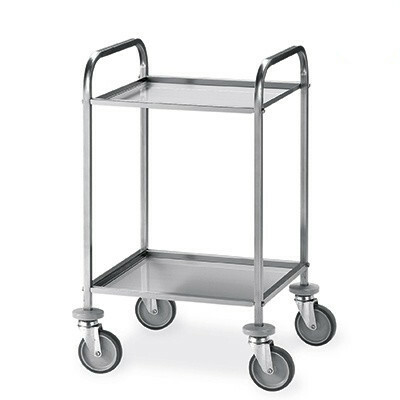 1520 is a service trolley with structure in stainless steel squared tube (cm 2x2, brushed finish). The shelves in stainless steel are tank-shaped, with 90° board anticut and depth of 1,5 cm. Bumpers are made of gray rubber and the swiveling wheels have a diameter of 12,5 cm.